Earlier this month, Fossil announced new Android Wear-based smartwatches, under its Kate Spade and Skagen brands. Both watches use the same round frame that the Misfit Vapor and Fossil Q Control have, but with different lug styles and bands. 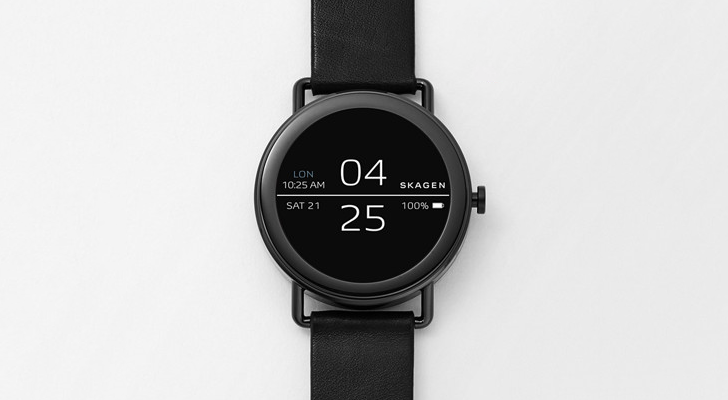 Now you can buy the Skagen Falster smartwatch, starting at $275. The watch has a Snapdragon Wear 2100 processor, with a round OLED screen of an unspecified resolution. Compared to the Misfit Vapor and Fossil Q Control, the Falster has a larger side button and larger lugs. There is probably no NFC or cellular support, since the FAQ and product listing don't mention those features. The Falster is available in three variants - Black Leather, Brown Leather, and Steel Mesh. The first two are $275, and the last is $295. If you're interested, you can buy it from the source link below.